The GUIGAL establishment vinifies and ages the wines from the Northern Rhône appellations of Côte-Rôtie, Condrieu, Hermitage, Saint-Joseph and Crozes-Hermitage in its cellars at Ampuis. The prestigious wines of the Southern Rhône appellations of Châteauneuf-du-Pape, Gigondas, Tavel and Côtes-du-Rhône are also aged in the cellars at Ampuis. The methods of viticulture are always in keeping with an omnipresent respect for the environment. Moderate, controlled prevention against illness and vine parasites allows the grapes cultivated on the estate to reveal fully the complexity of the most exceptional terroirs of the Northern Rhône. From generation to generation, the standards of excellence imposed on the selection and vinification processes have enabled the Guigal estate to present the Guigal Condrieu and Côte-Rôtie « Brune & Blonde » as exemplary benchmarks of these two prestigious appellations year after year. The Côte-Rôtie vineyards cover an area of about 230 hectares and are composed of the Côte Brune, upstream of the river Reynard and the Côte Blonde, situated down-river. These vines were planted by the Romans nearly 24 centuries ago. The Côte Brune makes its mark in a very masculine way with the nearly exclusive presence of Syrah. As for the Côte Blonde, a very feminine touch is added by the presence of Viognier which brings elegance to the Syrah. Much more than a museum, this vineyard is very much alive, although with yields which are limited intentionally. In the Côte-Rôtie, the GUIGAL estate owns several jewels including the famous Côte-Rôtie « La Mouline » situated on the Côte Blonde vineyard which distinguishes itself by its shape which is characteristic of a Roman amphitheatre. In this ancient theater, exceptionally, the enjoyment flows from the tiers to the arena. Situated on the Côte Brune, « La Turque » facing fully South benefits from maximum exposure to the sun and also from a complex terroir made up of Schist and iron oxide which transmit finesse and strength to the wine. With its vertiginous slopes of nearly 45 degrees, « La Landonne » is an extremely impressive vineyard. It is planted solely with Syrah. Finally, the Côte-Rôtie « Château d’Ampuis » is produced from historical plots which are also amongst the very best terroirs of the GUIGAL estate. The Condrieu appellation covers about 150 hectares. Overhanging the right bank of the Rhône, this vineyard is planted exclusively with Viognier, a variety imported from Dalmatia at the beginning of our era. Condrieu « La Doriane » is the jewel in our estate’s crown in this appellation. The GUIGAL estate also owns vineyards in Hermitage, Saint-Joseph and Crozes-Hermitage with prestigious plots and exceptional terroir. On the famous Hermitage slopes the red and white Ex-Voto wines, produced only in the very best vintages, emanate from evocatively named plots : Bessards, Hermite, Greffieux, Murets... Only by blending these precious terroirs can we produce THE bottle of the selected vintage, as if by magic. On the Right bank of the Rhône reign the properties of the Saint-Joseph appellation which previously belonged largely to the estate, Jean-louis GRIPPAT. 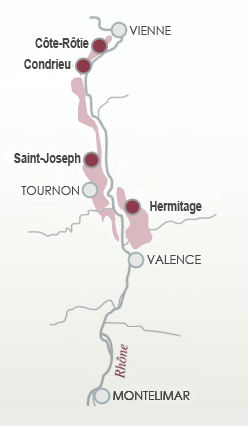 The Saint-Joseph « Lieu-Dit » planted with old vines, produces quality red and white wines which are undisputable benchmarks for this up-and-coming appellation in the Northern Rhône. Last but not least, Saint-joseph « Vignes de l’Hospice » is cultivated on a unique slope composed of granite. The vines are literally suspended on the vertiginous slopes which overlook the town of Tournon. This vineyard is a treasure which produces a precious and rare nectar. The GUIGAL estate comprises a total of around 60 hectares.